I guess I could, it might get me playing again. Looks like I beat you to it d00d! AeroCityMayor wrote: Looks like I beat you to it d00d! 170M+ stage 3 mid death. Need to perfect my stage 3 and 4 pics later..
Asure wrote: 170M+ stage 3 mid death. Need to perfect my stage 3 and 4 pics later.. So I been really trying to do some nice scoring runs while I practice on my new PCB, anyways, I am very pleased to break 200million and as a celebration of my progress I submit my score. Still need to learn Larsa's patterns because for the second time ever i make it to her on a 1cc, once again nerve and highstakes play in and i get punched in the face. Anyways here's the proof, so happy about this one. Loving the game so far too good purchase this was! God the cancel point sounds are quite orgasmic very rewarding!!!! 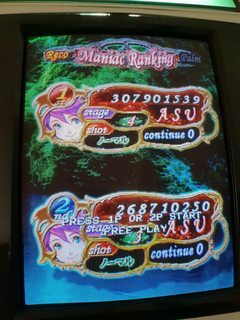 I finally beat my april 2017 score..
Maniac Reco normal 307.901.539 !